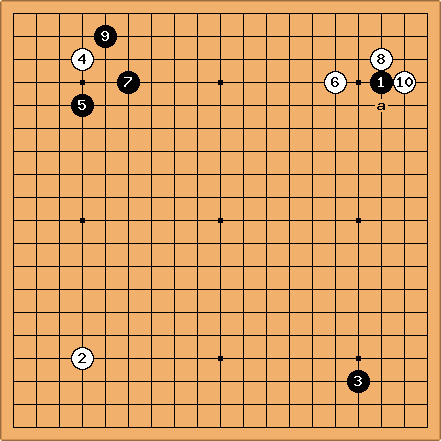 Yi Ch'ang-ho-Takemiya Masaki(B) 1996-04-10. and trade focal plays: after which the players follow a three-tenuki sequence in two parts of the board. After White lived, starting with a. Another example of murtual damage in the opening: Yun Yeong-seon with black against Hyeon Mi-chin at the 2nd december 2005. was dead, while was saved with a sequence starting at a until it was finally caught by move 58.